Walking and running are popular modes of transportation, especially during the spring and summer months when the weather is warmer. But pedestrians have to share the streets with motorists and cyclists, which means risking injury from negligent drivers. Many of Florida’s municipalities have taken steps to reduce the risks for pedestrians. The City of Coral Gables recently approved an ordinance lowering the speed limit on residential roads maintained by the city from 30 miles per hour to 25 miles per hour. The goal was to make the city’s streets safer for everyone, but especially for pedestrians, whose injury risk increases as vehicle speed increases. Pedestrians generally have the right of way within a marked (and sometimes unmarked) crosswalk. Vehicles must yield to pedestrians who have reached the halfway point or are quickly approaching it. However, pedestrians cannot enter crosswalks when it would constitute an immediate hazard. For example, if a car is practically on top of the crosswalk then that is not a safe time to cross the street. Additionally, pedestrians only have the right of way in marked crosswalks or within unmarked crosswalks at an intersection. 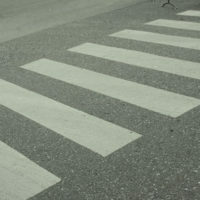 It will be more difficult to recover damages in a personal injury lawsuit if you broke the law in crossing the street. If there is a sidewalk, then pedestrians have to walk on it. In other words, you can’t walk (or run) on the road if there’s a sidewalk available to you. But if there isn’t a sidewalk, Florida law allows pedestrians to walk on the left side of the road (or in the shoulder), facing oncoming traffic. If you are legally walking on the side of the road and a car suddenly veers into you, you might have grounds for a personal injury lawsuit. Pedestrians also have the right of way on sidewalks. Drivers emerging from or entering an alley, driveway, private road or building that has a sidewalk extended across the entrance must yield to pedestrians. For example, if you are if you are walking on a sidewalk through your neighborhood that crosses driveways, cars entering or leaving must yield to you. Drivers owe a duty of care to pedestrians and must take extra precautions with children and those who are incapacitated. “Incapacitated” includes elderly pedestrians who are wheelchair-bound and even those who are obviously under the influence of drugs or alcohol. The law requires drivers to honk their horns when necessary (to alert a pedestrian to danger) and to do what they can to avoid pedestrian collisions. If you are a pedestrian who has been injured by an automobile driver, you might be entitled to compensation, especially if you can prove that a driver violated a city traffic ordinance or a state law. Contact a Miami personal injury attorney at The Pendas Law Firm today for a free consultation. We can help ensure that you receive damages for your medical bills, lost wages and other relevant expenses. The Pendas Law Firm also represents clients in the Fort Lauderdale, Tampa, Jacksonville, West Palm Beach, Fort Myers, Orlando, Daytona and Bradenton areas.